Bless us, Kyne; may we serve you with every word"
Kyne, or Kaan in the dragon language, is the Nordic goddess of the Storm, widow of Shor, Warrior-Wife, and a favored god of warriors. As the goddess of the Storm, she is strongly associated with wind and rain, and is thought to control both forces, even when they bring misery. She is often called the Mother of Men, as Nords believe the sky exhaled onto the land at the Throat of the World to form them. She is also called the "Kiss at the End", because Nords generally believe that she leads their dead to Sovngarde. Nords still refer to themselves as "the Sons and Daughters of Kyne". Some consider her to be the leader of the Nordic pantheon of Divines. 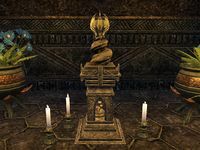 Kyne and Kynareth are considered by followers of the Nine Divines to be one and the same, though more ardent supporters of the Old Ways among the Nords dismiss Kynareth as a "pale shadow". While Nords also acknowledge Mara, the "Mother-Goddess" of the Empire, they view her only as Kyne's handmaiden. The trees near Kynesgrove (or Kyne's Grove) are thought to be sacred to her. Nords believe she first taught them how to wield the thu'um, or Storm Voice, though some sources claim she did so through her "daughters", while others single out Paarthurnax as her instrument. Appropriately, "Kaan" is a Word of Power, which can be used to soothe wild beasts, who are also believed to be her creation. Many great Tongues are considered to be blessed by Kyne, such as Wulfharth, the Storm of Kyne, and Morihaus, the "Bull of Kyne". Both have been called sons of Kyne and the Breath of Kyne. Some ancient legends speak of the goddess's personal intervention at important moments in Skyrim's history. Others suggest she was involved in granting the Amulet of Kings to St. Alessia. The ancient Nords associated her with the hawk. Bas-reliefs and totemic representations depicting Kyne can be found in various Nordic ruins throughout Skyrim. The Fryse Hags of Solstheim are known to especially venerate Kyne, and the Greybeards claim to act in her name in the rare occasions that they speak. ^ a b c d Froki Whetted-Blade's dialogue in Skyrim. ^ a b Reinhardt Red-Spear's dialogue in Bloodmoon. ^ the Prophet's dialogue in Knights of the Nine. ^ Proclamation of the Greybeards in Skyrim.